The sleek muscular Weimaraner is full of energy, it makes a rambunctious, yet affectionate pet! The Weimaraner has a strong hunting instinct, and skilled gun dog. Also called the Grey Ghost or Gray Ghosts, it was bred in the late 1700's throught the early 1800's, originally for royalty to hunt large game animals like deer and bear. Then later on it was used for smaller animals like rabbits and foxes. The Weimaraner can make a loyal and brave pet with proper socialization. They are protective of their families, making them good guard dogs. This breed is very active, and makes a great companion for an active and attentive person. When choosing a Weimaraner, check for hip or elbow dysplasia, thyroid and growth disorders, and bleeding disorders. 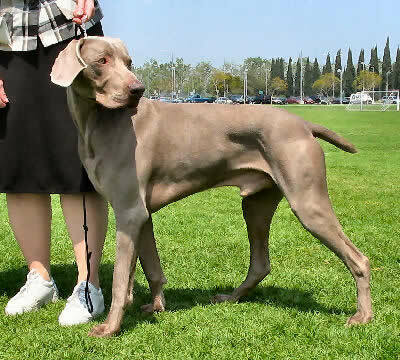 Breed Type Weimaraners are a sporting breed. Used to hunt a variety of game, they were favorites of royalty in the nineteenth century. Background The Weimaraner has been around for centuries. There is much debate about its ancestry, but the breed is believed to have originated in Europe. Breed standards were developed in the 1800s. There is a rare long-haired variety of the Weimaraner, but it is not recognized by North American kennel clubs. Popular hybrids include the Weimardoodle (Weimaraner and Poodle mix) and the Labmaraner (Labrador Retriever and Weimaraner mix). Description The Short-Haired Weimaraner is a slender yet muscular dog with a sleek, fine gray coat. The head and ears are slightly lighter in color. The ears are long, and they eyes are gray, bluish-gray, or amber. The breed has webbed feet and a docked tail. Males are 24-27 inches in height and weigh 55-70 pounds. Females are 22-25 inches tall and weigh 50-65 pounds. Care and Feeding Weimaraners need a diet high in animal fat. The diet should include poultry, lamb, potato, and grains. This breed is very prone to bloat, so it is advisable to feed two or three small meals each day. The Weimaraner's coat requires little care. Regular brushing and occasional dry shampooing are all that is necessary. It is important to keep an eye on the dog's feet and mouth, and to keep its nails trimmed. It is standard procedure to dock the short-haired Weimaraner's tail to 1 �½ inches at two days of age. Dewclaws are also removed during puppyhood. Weimaraners shed moderately, so regular vacuuming is a must if they are to be kept inside. Housing Your Dog Weimaraners can live indoors in small spaces, but only if they get plenty of exercise. They do best with a large yard. Social Behaviors Weimaraners are affectionate with their families. They tolerate children fairly well, but may be too rambunctious for small children. They may be aggressive with other dogs, and should not be trusted with small pets. Handling and Training This breed should be trained with a firm but gentle hand. They are very sensitive to any form of physical punishment and are nearly impossible to train if they are afraid of their trainers. Weimaraners may be slow to housebreak. Activities The Weimaraner needs plenty of exercise. Daily walks and jogs are imperative, and they need a chance to run off-leash as often as possible. They should not be exercised after meals. Breeding/Reproduction Weimaraners are a fairly healthy breed, but they do sometimes inherit health problems. When selecting a mate for your dog, check bloodlines for joint dysplasia, Von Willebrand's disease, thyroid and growth disorders, and kidney problems. Common Health Problems Bloat is one of the biggest concerns with Weims. It is important to feed and exercise them properly to avoid this. Thyroid and kidney problems are also somewhat common, and must be treated by a veterinarian. Availability Weimaraners may be hard to find in some areas, but breeders can be found with ease online. Prices are usually in the $400 to $800 range. Hi, I got my Ghost 6 yrs ago, I had Goldens prior. He is by far the smartest dog I've ever had, sometimes human! I can't say enough about my guy, the things he does how he acts towards me, other people and animals is uncanny. Never chewed, caused mischief, or has separation anxiety. Everyone in my town knows my dog , he's like the town pet! So happy I got him , not that my Goldens were great dogs and love them . He is another level in smarts, what he does is unbelievable. Can talk on and on but will end with, people if you want a challenge for the first two yrs, then he starts mellowing out then Writers are your dog, not a day goes by that I'm not amazed or hr gets complement , like what a gorgeous dog ! I've had a female GSP that I adored for her loyalty, but my female Weimer, is even better & more intelligent. She 'tells' you what she wants and feels. You never feel lonely with this breed. Very regimented. Should I get a puppy?My wife and I have two young children (3 5) and we have never owned a dog totegher. My brother-in-law has a female that he is trying to breed and now we are thinking of getting one of the pups. I work outside of the house, but my wife is a stay-at-home-mom which really means that she is out running around most of the time. I'm just concerned if we are biting off more than we can chew (especially with this breed). To be honest, if my brother-in-law wasn't breeding his dog, we wouldn't even be thinking of getting one. I know these dogs are very energetic and require a lot of attention. Any information from someone who does/has owned a weimaraner would be greatly appreciated. Also, what are the pros/cons of getting a female versus a male?I know it matters, so I will say that I do like dogs. I may have worded my question to give the impression that I don't. Also, I have nearly a half acre yard in town that is fully fenced. Only you can determine if you wish to get a puppy. You say you wouldn't even be considering it unles your brother was breeding them. That's a wee bit of a concern. Yes a Weimaraner is a high energy pet. Real high energy. They love toplay, love attention and love to get into things that are not necessaryily put away. My daughter has one and when I have slept over he will go from their bed to my grandsons to mine to make sure we are all just fine. He sleeps with each of us for about an hour. He is in the garbage, he sometimes takes the bunnies outside, he plays with anything that is a toy. He is lovable, laughable, affectionate and good with children. Males and female - you neuter/spay and I don't (just me) believe major differences) They are not small pups and I'd think about handling the space with the 3 and 5 year old and housebreaking etc. Then I'd go ahead and do it anyway. They are loyal and make awesome pets!